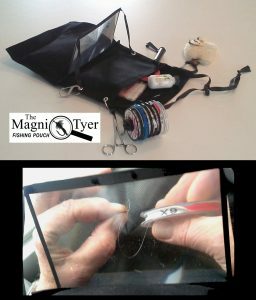 Along with providing convenient storage for fishing accessories, the MagniTyer Fishing Pouch includes a Fresnel magnifying lens that enlarges up to 300%, making it an ideal piece of gear for any angler with vision limitations. SANDWICH, MA – MARCH 2018 Designed for any fisherman with vision problems, the MagniTyer Fishing Pouch combines a large (@35 sq. in.) fold-down Fresnel magnifying lens that enlarges up to 300% with convenient storage for fishing accessories. With a strong, adjustable neck strap and sewn in belt loops, the MagniTyer Fishing Pouch can be positioned in front of the chest making the two storage pockets easily accessible for essential fishing gear while wading or fishing from a boat. It is especially suited for kayak fishing where physical space and mobility are limited. Each MagniTyer Fishing Pouch is cut and stitched from water-resistant 12 oz. canvas here in the USA. There are two storage compartments – one accessible from the top and the other from the side. Each is secured with Velcro closures and measures about 8” w x 5” t. There are also four metal grommets for adding more accessories as needed. Fully opened, the MagniTyer Fishing Pouch measures 9.5” wide x 15” tall and folds to only 7” tall. If you would like more information about this product, please call Barry Haskell at 508-296-5999, or email him at [email protected]. To order online, go to www.MagniTyer.com.